- An additional Oxymizer cannula. The XCR(Cross Country Racer) is a high-duration carry-on oxygen system for multiple aviation uses. The XCR systems feature the AL series aluminum cylinders as standard issue. The XCR is an excellent choice for the pilot who needs a small, wearable system for Hang Gliding, Para Gliding, Sail Plane Soaring or any situation where space is at a minimum and ease of use is a must. 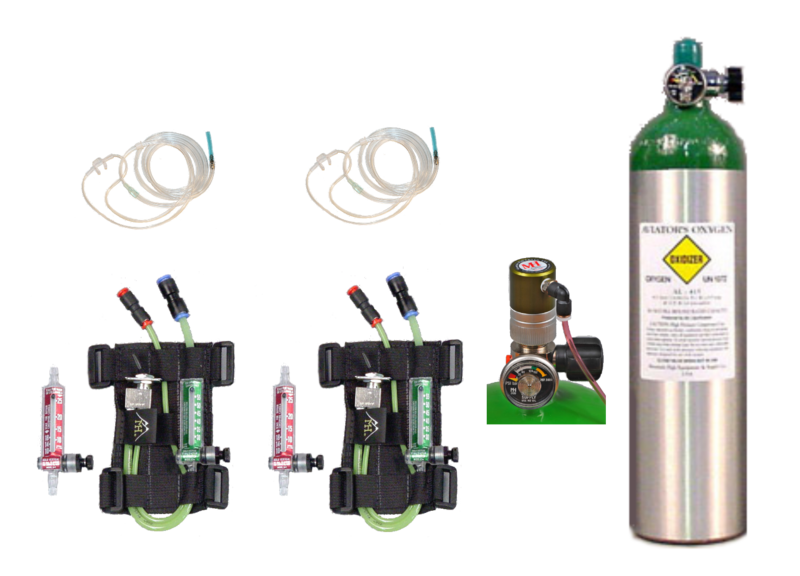 The XCR system is comprised of the cylinder, the radial style primary reducing XCR regulator, 5 ft. of high-quality kink-proof 4mm OD polyurethane tubing, one XCR control-holster with either a MH-3 (FL180) or MH-4 (FL250) Flowmeter with remote on/off valve and an "M" type Oxymizer oxygen conserving cannula. The system can be strapped to your flight-suit or hang gliding harness. There are 'D' rings on the corners of the pilot control harness/holster for mounting to an arm, leg, shoulder-strap, uprights or almost any suitable object. Straps not included. All XCR systems includes tote bag.